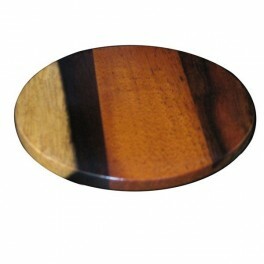 Beautiful and practical, round, mixed hardwood coasters protect your table tops and surfaces. Assortment of hardwoods includes: purple heart, granadillo, hobillo, rosewood, manchiche (aka “Mayan walnut”), brown rosewood, guanacaste, and ziricote. The polyurethane coating seals the wood with shine and celebrates the gorgeous natural colors of the wood.